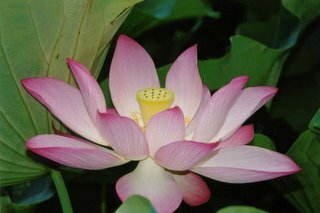 The sacred Lotus flower, Nelumbo nucifera. Lotus – the flower is sacred to the Hindus and is interwoven into the Hindu way of life from the Vedic times to the modern age. It represents beauty, purity, fertility and youth. Bhagawad Gita says that man must emulate the lotus’s way - the water on a lotus leaf just rolls away. The beautiful white Lotus arises out of muddy waters – in the same manner should man rise above the sins of his mundane existence . . .
For Buddhists – Lotus symbolizes the most glorious state of man. Lotus has been venerated throughout the ages. . . Goddess Saraswathi sits on a white lotus. The Hindu scriptures say that the Atman [soul] dwells in the lotus within the heart. The leaves are coated with a film – upon which water forms beautiful ready-to-roll-off glittering droplets. Lotus comes in different colours – namely white, red, blue, pink and purple. The flower rising above the leaves, appear one at a time. Each flower lasts for just 2 to 5 days only and darkens soon after. by Prof. P.C. Jain and Dr Daljeet. Parijata, a sweet-smelling flower, often used in worship. The lotus stem is made into a delicious dish called kamal kakri and loved by indians.